When travelers arrive in a new location, the first two things that they are likely to seek out are places of interest in the area to visit, and directions on how to get there. The purpose of quality guidebooks is to inform guests (and locals) about local businesses and organizations in an elegant printed format. Guidebooks also provide an excellent opportunity for area membership leaders to promote certain towns, events, cultural attractions and recreational locations. Guidebooks are an indispensable piece of smart marketing strategy for any business council or chamber of commers - in particular for areas with tourist driven economies, such as those located near ski mountains. Despite the modern prevalence of GPS, printed regional maps remain the number one most picked up item at state Welcome Centers. Visitors are looking for a quick, easy to digest overview of the regions attractions, and holding a tangible product can give reassurance. In the past, we have also produced maps and mobile applications as complimentary assets to one another, so that the map can be scanned to download an app or mobile site for more information about given locations. This augmented reality approach to local maps can really give the best of both worlds to visitors, and takes full advantage of smartphone GPS capabilities. 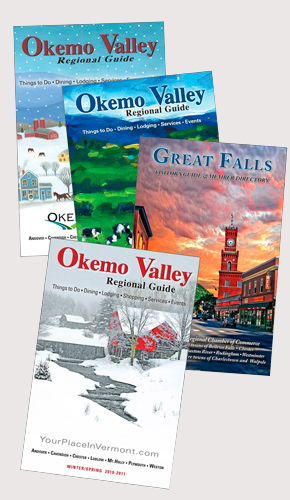 To view one of our regional mobile apps, you can download the Okemo Valley Regional App for iPhone, iPad, Android and Mobile Web. A good regional map will not only serve as a resource for finding local destinations and businesses, but also encourage visits to those restaurants, motels, retail outlets and more that are within the user's proximity. This can be a great asset to local walk in traffic. At Got2Web, we are well experienced with evers aspect of map and guidebook making process. Our own in-house team is capable of handling projects from start to finish, although in the past we have made arrangements to share duties you feel you can handle for your financial benefit. Production tasks we typically tackle in the course of a map or guidebook creation include: project management, financial management, database management, content organization, feature writing, ad sales, ad design, book/map design and production, print management, distribution, ad billing and collection. For more info or a project quote, please contact us.